The story of Natalio is very precious. He is blind and faced many difficulties in life – but he faced those difficulties with dignity. In spite of his limitations, he worked in an Institute where blind people can interact with others with the same condition and realize they are not alone in facing their illness. I went to visit him in his humble home in a very poor neighborhood. While waiting for him I was able to speak with his family. His wife was very kind and we started to chat and, as always, the question came up – why are we so dedicated in working for Israel. 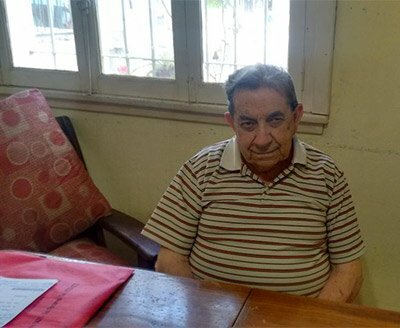 I answered: “I don’t know if you believe in God, but I believe that God hasn’t forgotten Israel, His people.” She told me that life had taught her there is no God, and then Natalio arrived and we began to speak a little about his life. Natalio’s daughters and grandchildren live in Israel, a brother of his died in the Six Day War there. Natalio was concerned that his son would barely be able to care for one person (his mother) let alone two and this affected his decision to leave and join his daughters in Israel. If it hadn’t been for Ezra’s help it would have been very difficult for him to gather the resources to join his children and grandchildren. He told me, “You know, in such a wicked world, it’s good for me to know there are good people. You should be in the news!” I answered him, “It’s a privilege for us who know the God of Israel and to know that this God wants His people home.” We hugged – and even prayed together despite his atheism. We trust a seed was sown – and believe that one day that initial spark will open Natalio’s heart to the God of Israel. Natalio made Aliyah in January 2018.